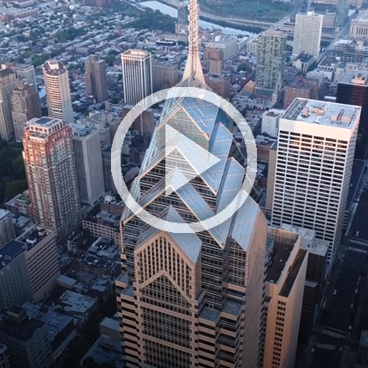 As a Tenant of ONE Liberty Place, we welcome you to THE ROOM! 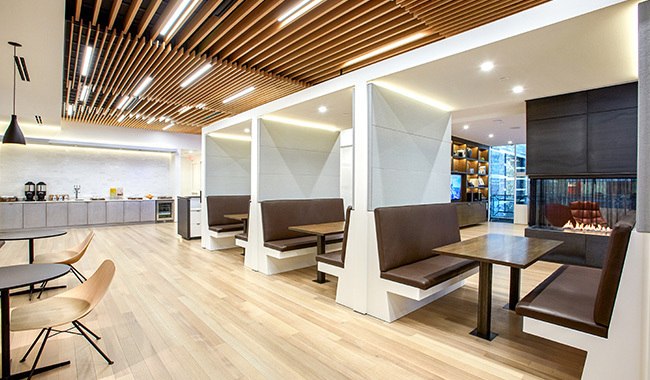 THE ROOM provides the perfect space to take a break from your desk and enjoy ONE Liberty Place’s exclusive tenant lounge, co-working space and set of conference suites. THE ROOM was designed to provide a space where tenants can relax, co-work with each other and other building tenants, and host private events. THE ROOM also offers two beautiful private conference suites that are equipped with all of your audio visual needs to host your next meeting or seminar. Whether you are listening to your favorite record on the turntable in the Library Lounge, celebrating closing a deal with a drink at happy hour, or need your afternoon caffeine rush; we are certain you will enjoy THE ROOM. THE ROOM is located on the Third Floor of ONE Liberty Place and is open Monday – Friday, 8:00 am until 7:00 pm. THE ROOM is accessible from the ground floor via the third-floor shuttle to the left as you enter from the Main Lobby. THE ROOM is closed on Saturdays and Sundays as well as Building Holidays. Our Small Conference Suite provides an intimate boardroom style setting that can accommodate up to 10 people. 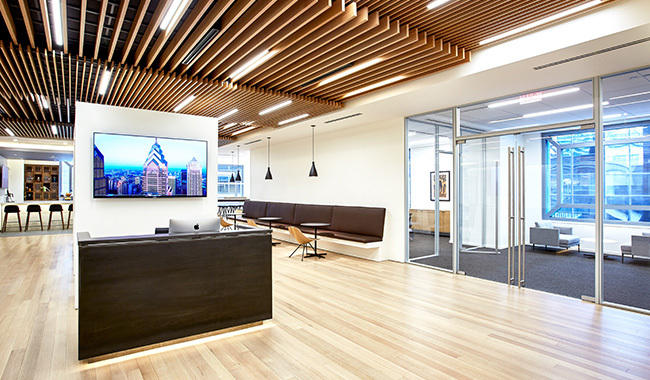 This classy space provides all the necessities, including state of the art audio and videoconferencing technology capabilities, video conferencing, and high-speed wireless internet access. Our Large Conference Suite can accommodate up to 50 people with a possibility of six different configurations. The Suite is equipped with state of the art AV technology and also provides a small break out area and direct access to the kitchen for catering. The Large Conference Suite is the perfect flexible space to host your next successful meeting, conference, or training seminar. Reservation requests for the Conference Suites can be made through the www.buildingengines.com Resource Schedule. A Guest Services Representative will contact you to confirm your reservation and help facilitate your meeting needs. The Library Lounge is the perfect place for tenants to unwind. 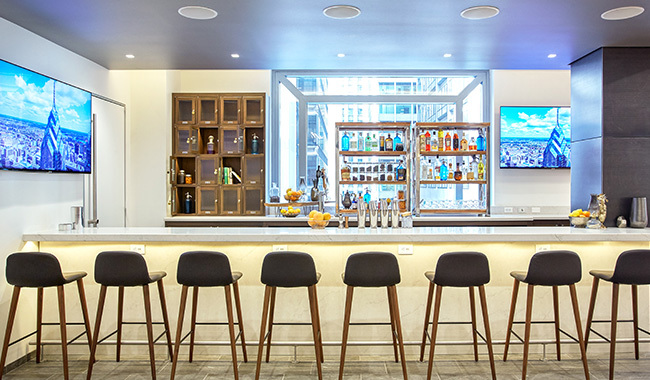 The lounge boasts distinctive touches including a bookshelf stocked with major newspapers and journals, a vintage record player with a custom-curated vinyl collection, and access to the private indoor balcony overlooking the Building’s striking marble lobby atrium. The Library Lounge is furnished with leather décor surrounded by the ambience of a working fire feature. THE ROOM’s full-service bar and kitchen provides the optimal environment for tenants’ private catered events. The kitchen includes a refrigerator, ice-maker, microwave, dishwasher and generous counter-top space for food service. The full-service bar is also equipped with a bottle cooler, beer dispenser, ware washer, ice well and refrigerator. The entire space is available to our tenants to rent on an exclusive use situation. Please contact THE ROOM Guest Services Lead, Roopa Patel at theroom@onelibertyplace.com to book your next company social event in THE ROOM. THE ROOM membership is complimentary to all building tenants. Please review the form below and return the signed form to theroom@onelibertyplace.com or drop off at the Guest Services Desk in THE ROOM on the Third Floor. Please allow 2 business days for access authorization to be programmed to your existing Building access card. Access to THE ROOM via the two main entrances will be granted at this time. Any additional questions can be directed to THE ROOM Guest Services Lead, Roopa Patel at theroom@onelibertyplace.com. For more information on our concierge services, click here or email Roopa Patel at theroom@onelibertyplace.com.